India has been blessed with an exquisite wildlife and to preserve them the concerned authorities have constructed wildlife reserve. If you want to encounter the wildlife of the country, especially the big cats then opt for Ranthambore and Corbett Tour. This package of 12 nights and 13 days offers you a chance to visit Ranthambore national park and Jim Corbett national park. During the itinerary, you also visit destinations like Mumbai, Aurangabad, Jaipur and Agra. On arrival in Mumbai, you are received with a traditional welcome by an IHPL representative. Get transfer to your hotel, check in and rest for a while. The day is free for leisure activities such as exploring the famous markets and the beaches, interacting with the locals etc. Stay overnight. The morning of the second day is at leisure. In the afternoon, embark on a city tour which covers the major tourist attractions such as the Hanging Garden, the Gateway of India, Siddhivinayak temple etc. Stay overnight in Mumbai hotel. In the morning, after breakfast, get an on-time transfer to the airport to board a flight to Aurangabad. On arrival, check-in at the hotel. 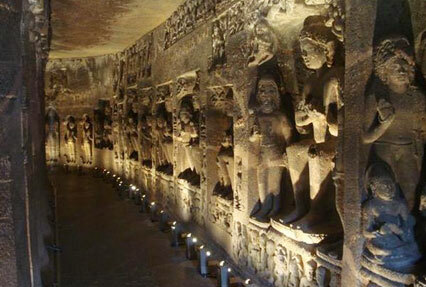 Later, go and visit the world-renowned Ellora Caves. These 34 Hindu and Buddhist caves come under the category of a world heritage site and are an example of superb Indian rock-cut architecture. Overnight stay. On the 4th day of the tour, you leave for an excursion the Ajanta Caves that come under the category of UNESCO world heritage site. These 30 rock-cut Buddhist caves are masterpieces of Buddhist religious art. Back to Aurangabad for staying overnight. After breakfast, get transported to the airport to board a flight to Jaipur via Mumbai. On arrival, complete the check-in formalities at your pre-boo hotel. Spend rest of the day at leisure, indulge in talking to the locals, exploring the bazaar, relish tasty food and so on. Stay overnight. 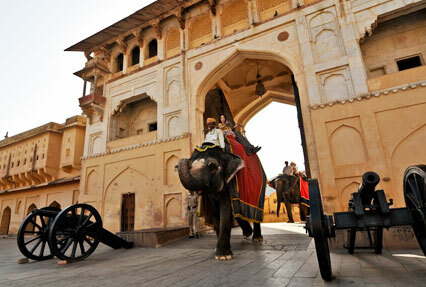 The morning of the sixth day is for a visit to Amer Fort where you ride on an elephant’s back to go up to its entrance. In the other part of the day, you visit the remaining attractions of Jaipur which may include Hawa Mahal, City Palace. In the evening, you can shop for souvenirs at the local bazaar. Stay overnight. In the morning, after breakfast, begin driving towards the Ranthambore National Park. After reaching, check into your pre-booked wildlife lodge. In the afternoon, once you have your lunch, embark on a wildlife safari into the Ranthambore National Park. Overnight stay in the wildlife lodge. Day 8 is booked for morning and afternoon safaris in Ranthambore, one of the largest and well-known national parks of India. This park boasts of being home to a large population of the big cats. Other wildlife species that you can spot during your safaris are Indian wild boar, Sambar deer, Hulman, Spotted deer and many more. Stay overnight at the wildlife lodge. Today after breakfast, you get transported to Agra by road. 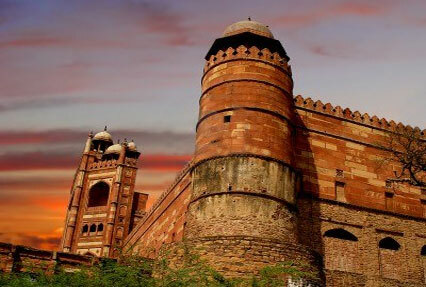 On the way, you are going to take a halt to explore the ruins of Fatehpur Sikri, a UNESCO world heritage site, once the Mughal capital. On arriving, complete the check-in formalities at your pre-booked hotel. The rest of the day is free to indulge in the activities of your interest such as exploring the local bazaar. Stay overnight. The 10th of the tour is for visiting the popular tourist attractions of Agra including the Taj Mahal, one of Seven Wonders of the World, which is a world heritage site as well. This white marble mausoleum was constructed by Mughal Emperor Shah Jahan for his beloved wife Mumtaz Mahal. Have dinner first and later get transferred to the railway station to board an overnight train to Lal Kuan. In the morning, once you arrive at Lal Kuan, hit the road to go to Jim Corbett National Park, the oldest national park in the country. After arriving, complete the check-in formalities at your jungle resort. Later, enjoy a safari into the park for wildlife viewing. Stay overnight. On the morning of day 14, post breakfast, embark on take a jeep safari to the Dhikala Forest, one of the most well-known spots of Corbett from where you can enjoy a great view of the surrounding. Check-in at the lodge, once you arrive here. In the afternoon, enjoy an elephant ride to view the wildlife of the forest that may include hog deer, chital and more. Stay overnight. In the morning, enjoy a jeep safari into the national park to discover exotic wildlife of the region. Back to the lodge for breakfast. Later, begin driving towards Delhi. On arrival, get transferred to the airport to board a flight for your onward destination. 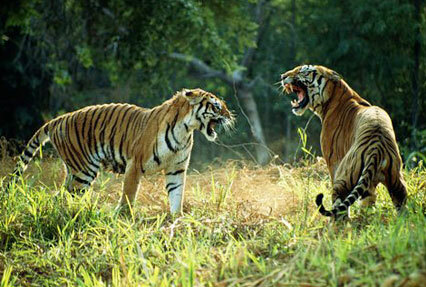 Indian Holiday offers Indian wildlife tours to Ranthambore National Park. 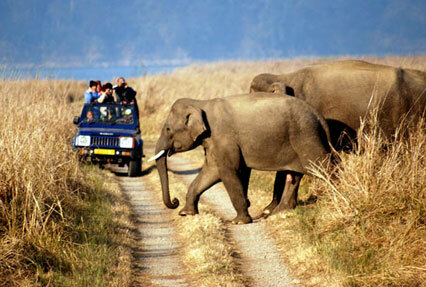 For more information or to book a wildlife tour, please enter your query in the query form.